Free Vegas Hits Slots - Play Your Favorite Bally Games! Las Vegas is the gambling capital of the world, with millions of people every year descending upon the Nevada city. Head into a Vegas casino and you’ll enjoy an experience like no other, whether playing slots, blackjack, roulette or any other of the wide variety of games on offer. This Bally designed slot features all of the most popular casino games on the reels, with sevens and cherries thrown in too. The main feature sees you given a spin of the bonus wheel, where you’ll be awarded with one of the many free spins features in the game. Land the money wheel for an instant cash boost and 5 free spins too. 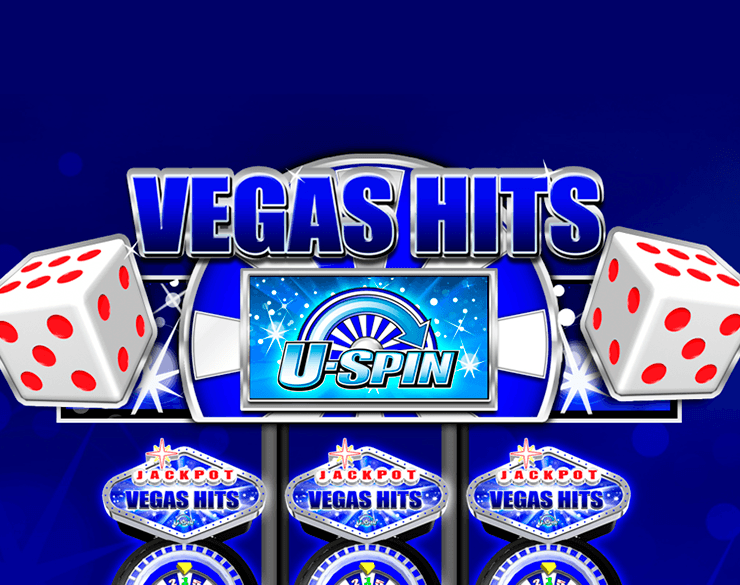 Vegas Hits is a five-reel slot featuring 40 win-lines that pay from left to right. You’ll pay 40 credits for each spin, to reflect the number of win-lines. The base game is a little unusual in the fact that there are no wilds in play, but this is more than made up for when you enter the feature. The highest paying symbol in the game is the famous Las Vegas sign, welcoming people into the city. Land the blue, glowing sign five times in a row and you’ll pocket a generous 1,000 coins. A mini slot (a slot within a slot!) showing cherries and bars is next on the pay table and is worth 500 coins. A roulette wheel and a blackjack hand pay 200 and 150 coins respectively. At the lower end of the pay table you’ll find a red seven, a bar symbol with a spade playing card, a cherry and a single die. Throughout the game ‘poker chip multipliers’ can appear on any of the reels. Unlike other symbols, just a single chip appearing will give you an instant win. The green chip awards you 1x your total stake, the red chip 5x, the blue chip 10x and the yellow chip 25x. The Bonus Wheel feature is activated by landing the bonus symbol of the same name on reels 2, 3 and 4. You’ll now be presented by a large bonus wheel. Every segment of the wheel apart from one will give you entry into a free spins bonus round. The one different segment enters you into the money wheel feature. The free spins rounds on offer are varied. For example, you might find yourself with 3 free spins where all of the dice symbols will now be wild. You could also win 2 free spins where both of reels 2 and 4 will be completely wild. You might find yourself with 3 free spins featuring only the top 4 paying symbols in the game. You could even win a spin where the poker chip symbols fill the reels. As you can see, the wins on offer give the game much variety and make for a very interesting feature. You can enter the Money Wheel feature by landing on the appropriate segment on the bonus wheel or by landing the money wheel scatter on reels 2, 3 and 4 in the base game. First, you’ll be awarded five free spins, with the wild symbol locked on a different reel for each of the spins. Then you’ll have a spin of the money wheel, where you’ll find some big numbers. The biggest win of all is 1000x your total stake – a huge boost to your bankroll. Vegas Hits slot machines have a fun, all-action feel to it. Below the reels you’ll see a desert scene, with Nevada mountains in the distance. In contrast, above the reels you’ll the title in flashing lights. The whole game is set against a dark blue background, featuring the range of very colourful symbols. The design has a busy feel which reflects the 24-hour nature of Vegas. Check out the upbeat soundtrack every time you hit the spin button too! Vegas Hits slots are a fun filled slot machine from the very start. The range of casino symbols is certainly eye-catching – how often do you find a roulette wheel or dice on the reels of a slot? The game play is entertaining and slightly unique too. With 40 win-lines, the wins will be frequent, while the instant wins from the poker chips are always a nice boost. The two wheels add great variety to the game – you’ll simply never now which bonus round you’ll play or how much you’ll win. Put it all together and this game is a winner.